Hatching chicks in the classroom is probably my favorite activity every year! 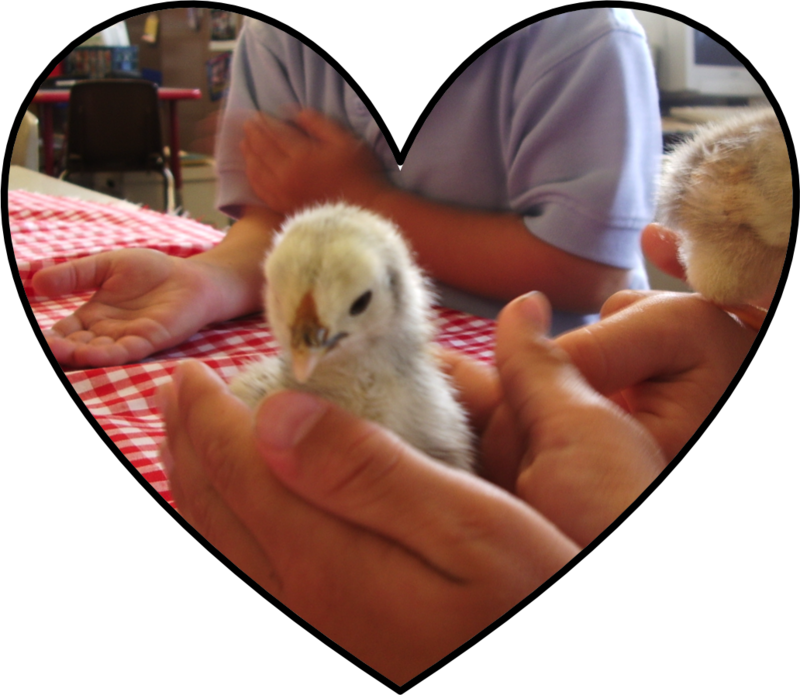 Not only is it a wonderful hands-on life science lesson, hatching chicks in the classroom also creates the perfect stage for you to teach concepts across the curriculum because your students are so engaged! 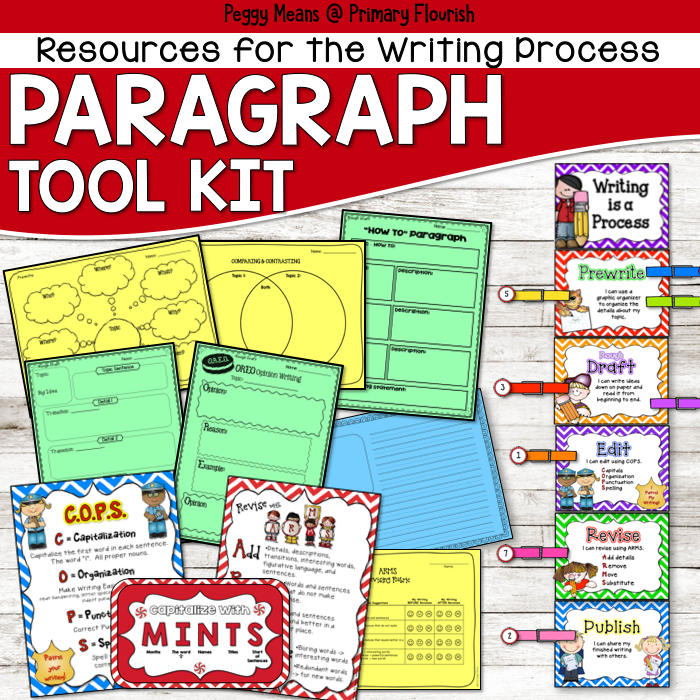 You can use this engagement for teaching content standards in science, math, reading, writing and art. 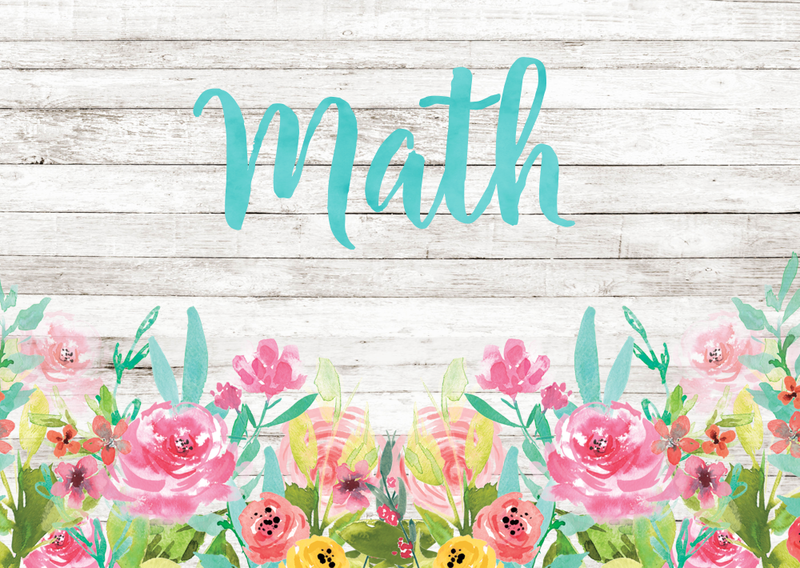 I am here to share my hatching secrets with you – and hopefully encourage you on your hatching and teaching adventures! Murray McMurray Hatchery – before I found a friend who raised chickens, I ordered from them. They were expensive, but reliable. 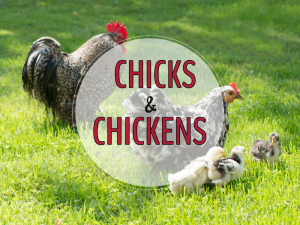 You are also going to need to find someone to ‘adopt’ the chicks – they are not pets and will need to have a home with someone with a chicken coop for them to live in. 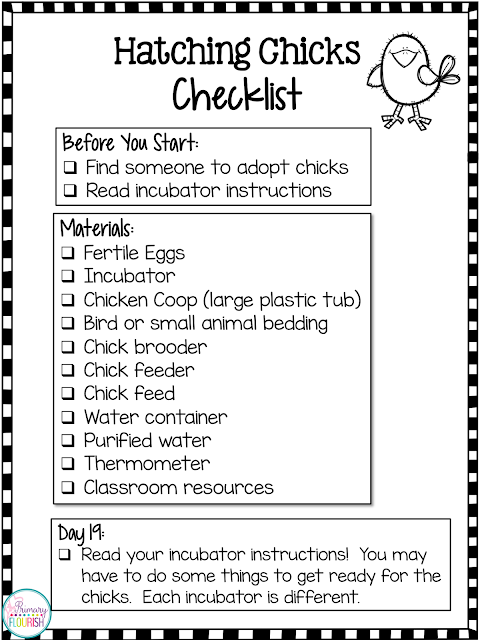 The next thing you are going to want to have is an incubator. 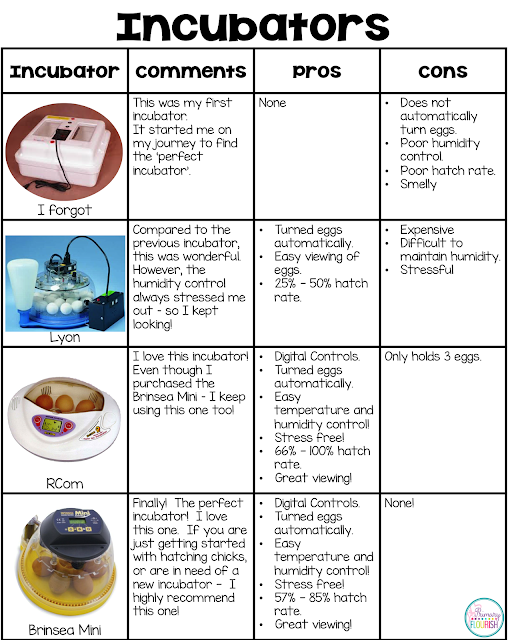 I’ve had a long search for the perfect incubator and I am delighted to tell you – I have found the perfect incubator! I made a table of my findings for you. The Brinsea Mini is by far the best incubator I have found! It has digital controls for temperature, humidity and turning the eggs. It even stops turning two days before hatching – it definitely removed many of the little stress factors that I found in my earlier hatchings. I purchased the Brines Mini incubator from Amazon.com. I recommend setting your eggs on a Tuesday, Wednesday, or Thursday. So if your chicks decide to come early- they aren’t hatching on a Sunday. 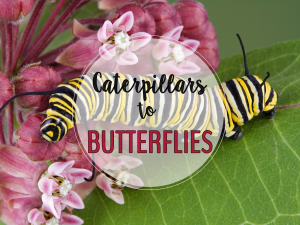 And if they are late – they are not hatching on Saturday. 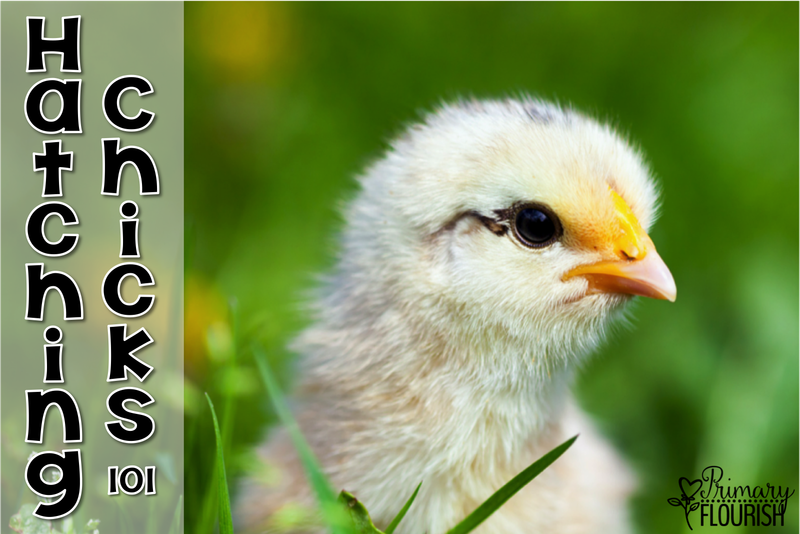 Once you have the eggs and the incubator, you have 21 days to get ready for those cute little chicks! I like to have a check list, so I don’t forget anything. 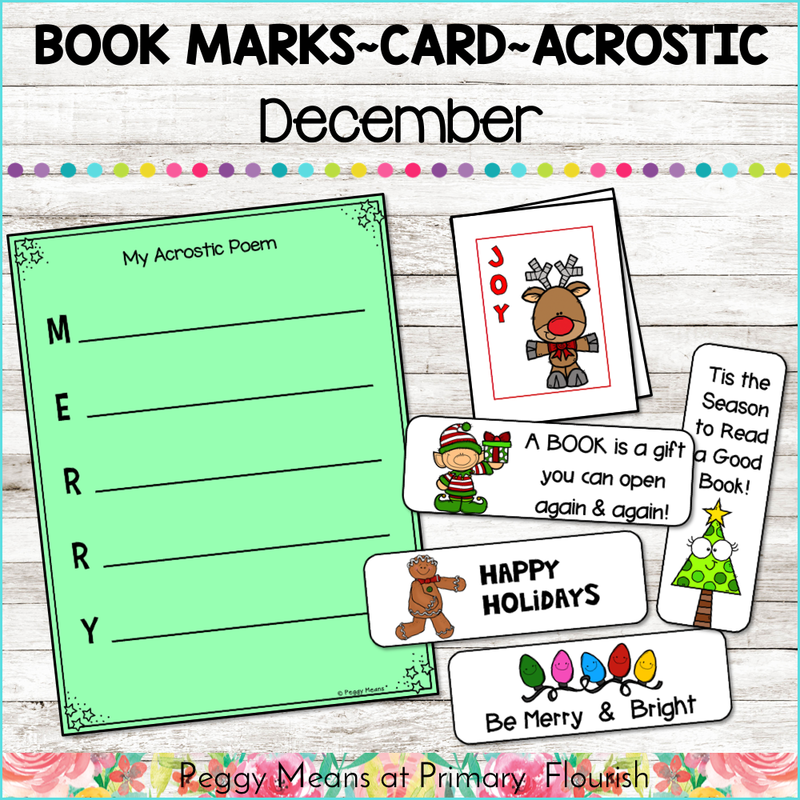 I have included this checklist and other resources for you in a free packet. Just click on the DOWNLOAD at the end of this post. You can find most of these things at a local feed store. However, if you do not have one nearby – there is always Amazon…. I like to launch the Life Cycle of Chicken unit with an Egg Lab. 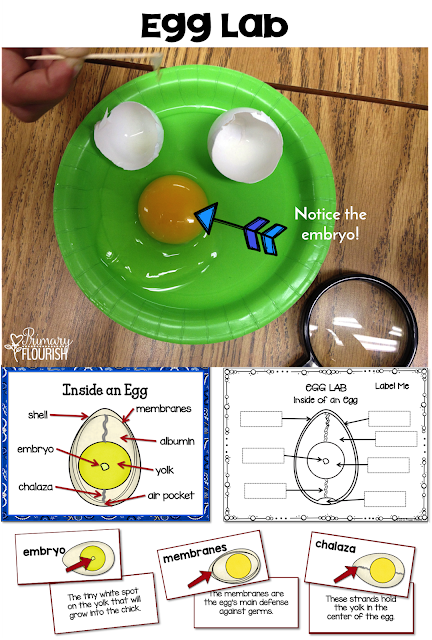 Most kids have seen the inside of an egg a jillion times – so I am continually amazed at how focused and engaged they are when we do this lab! It’s almost like they have never seen an egg before, and in a way they never have ‘seen’ it as the beginning of life for a chick. They love exploring the outside and inside! They love learning the names for all those parts and what they do for the growing chick. discuss the function of each part. 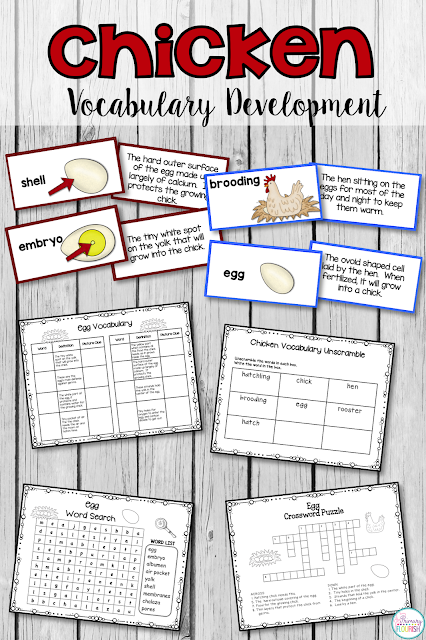 Egg Vocabulary: shell, pores, membranes, air pocket, yolk, embryo, chalaza, and albumen. 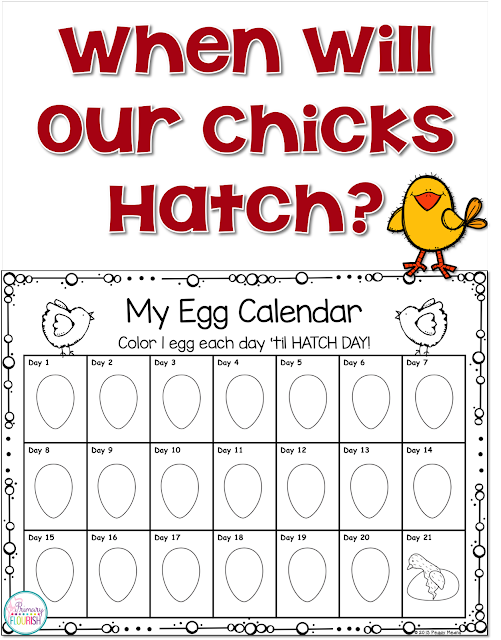 Students love keeping track of how many days until Hatch Day on this calendar! I keep a large one on our science focus wall and fill in an egg each day. 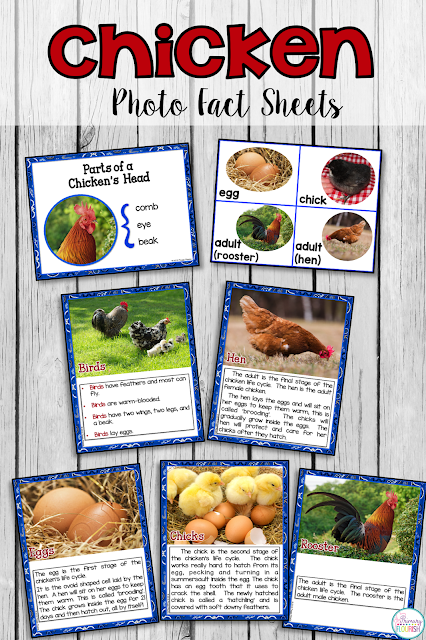 Students could also do this in their own copy in ‘All About Chickens’ study guide. 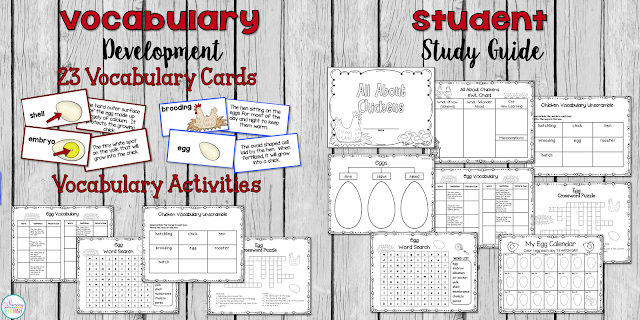 Some of your students may even want to draw on their calendars to show the embryonic development. 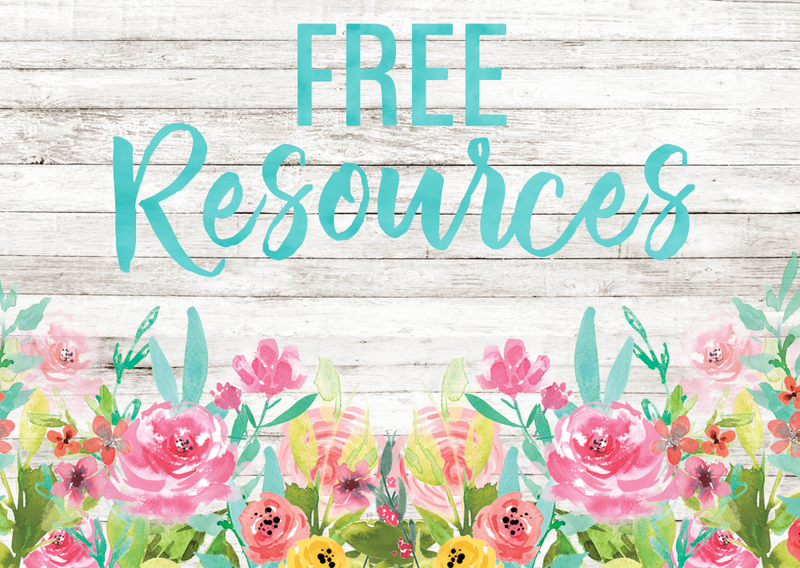 Find link to download these free resources below. The ‘Chick Life Cycle’ by Learning Resources is a fun hands-on resource. The students can see what their chicks look like each day. In the picture below, the students put the days 17, 18, and 19 in front of the incubator – so they could see what the chicks were looking like over the weekend! 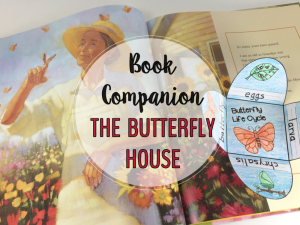 Here are my very favorite nonfiction books I read to and with students during the 21 day wait. The waiting is filled with lots of activities. 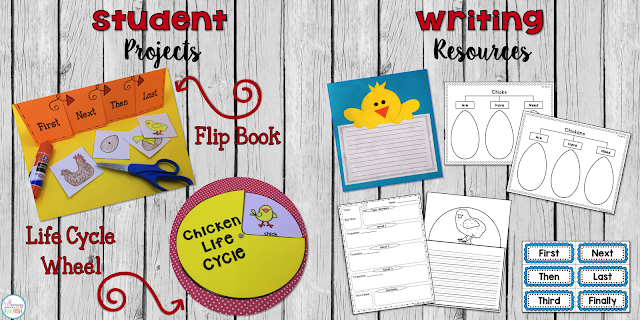 The kids are so motivated to research, read, discuss, and write about all things chicks! 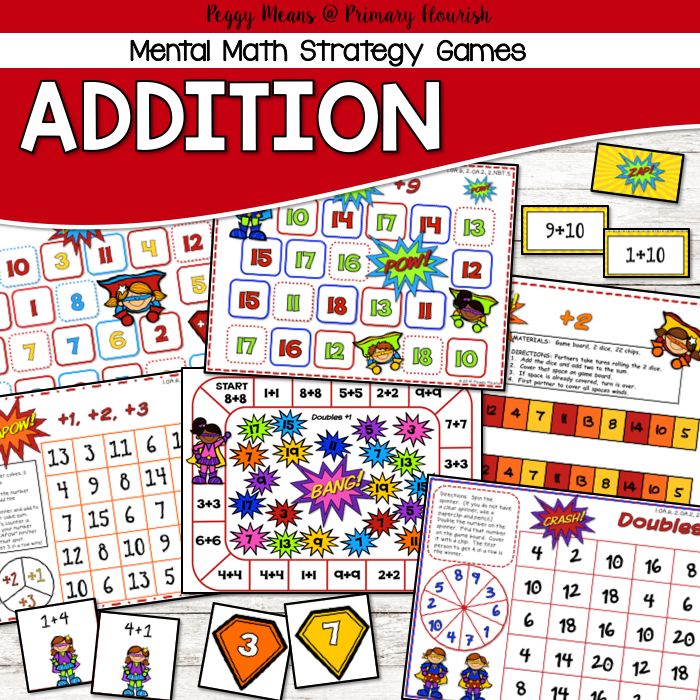 I provide lots of opportunities for as many curriculum areas as possible. 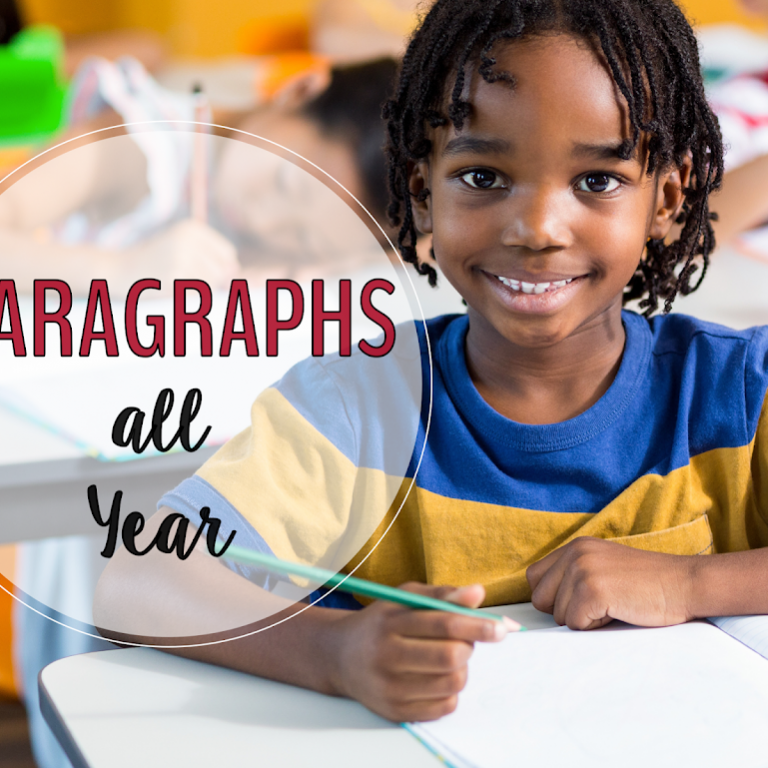 As you do this with your students, I am sure you will think of a plethora of ways to incorporate your content standards! Waiting for hatch day is like waiting for Christmas! I love to come in early on hatch day, open the classroom door, listen for peeps, and scurry over to the incubator. Often an ‘early bird’ hatched in the night. I search for pips – the first little cracks that the chicks make. If you listen really closely, sometimes you can hear the chicks peeping – even before they have pipped! 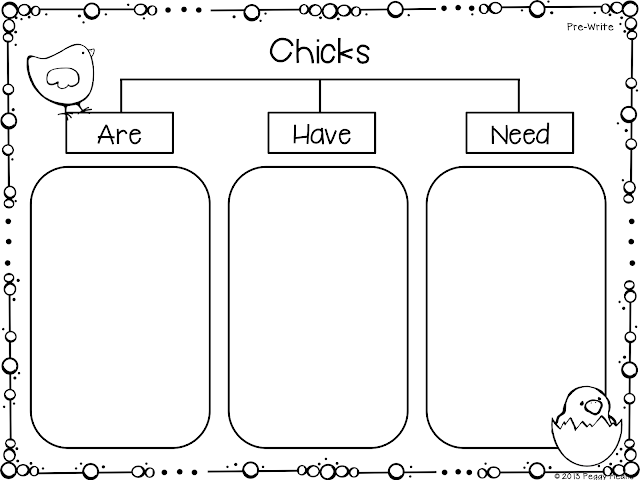 When the students arrive in the classroom, set up a ‘Chick Watch’ schedule. 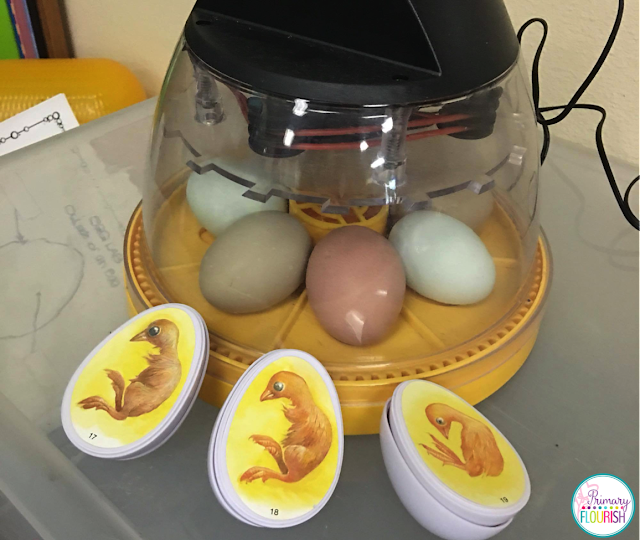 I let teams of students gather around the incubator to watch for pips, listen for peeps, and even make quiet little peeps for the eggs to encourage the unhatched chicks to get busy. If a chick starts to hatch, the ‘Chick Watch’ team can then signal you so that you can let the class watch the amazing event! The chicks are quite wet and weak when they first hatch (more like flop) out of the egg. They nap a bit, dry off, fluff up, and begin pecking at the other eggs within an hour or so. 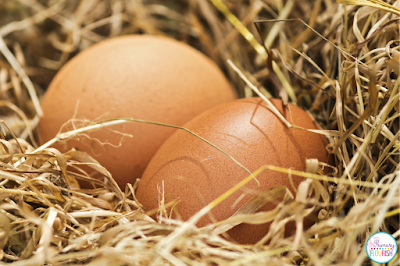 Do not be in a rush to take the chicks out of the incubator, their presence will encourage the unhatched chicks to hatch. They should be taken out and put into a brooder within 24 hours of hatching. 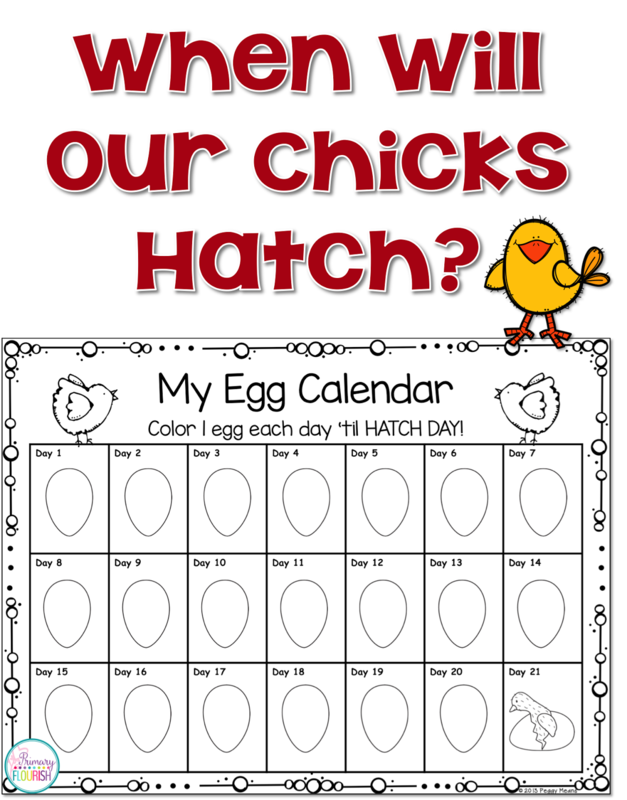 Usually, all the chicks that are going to hatch have hatched, and you can put the whole clutch in your brooder. Here is a lovely video of a chick hatching with its mamma hen! I especially love this one because it shows how the mother hen cares for and protects her chicks. You are going to be the ‘mama hen’ taking care of your little brood. 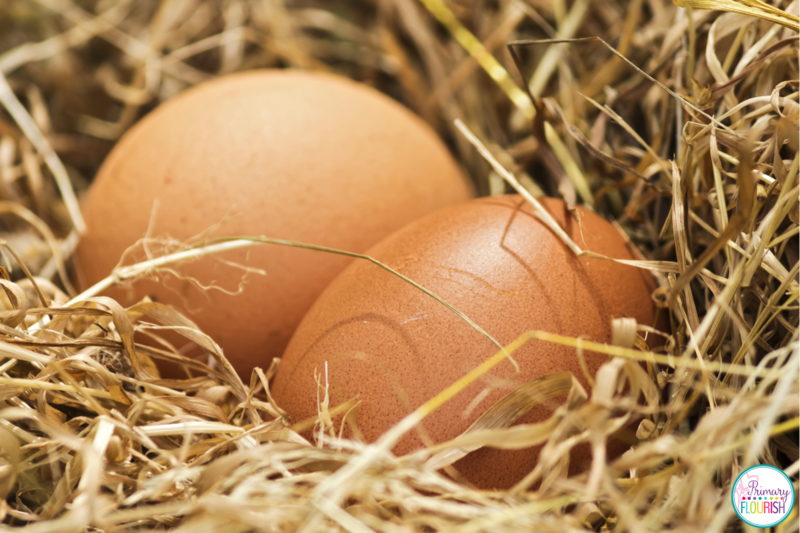 You are going to want to have your ‘Chicken Coop’ all set up and ready on hatch day. 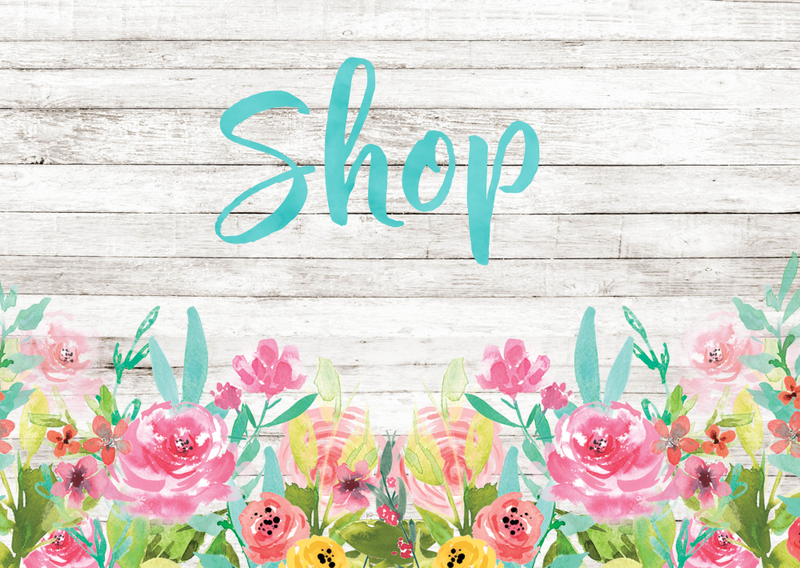 I have included some affiliate links to Amazon below – a quick and easy way to gather your supplies. I stress that chicks are fragile, so we can’t grab or squeeze them. They may poop, so if they are holding a chick and it does, they do not throw it off. 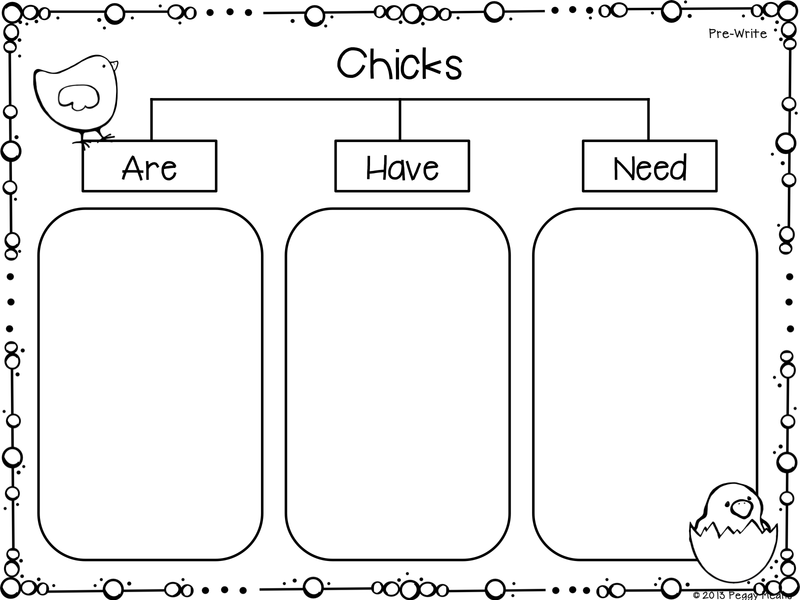 You are now ready for the chicks! Put an oil cloth on the floor. Have kids sit around in a circle. I then put a dish with some food in the center and ask the kids to just put their hands down and wait for the chicks to come to them (sometimes they do). I will then go around and place a chick in the hands of kids that are being quiet and peaceful. After about a minute we rotate the chicks so that all who want to hold one can. 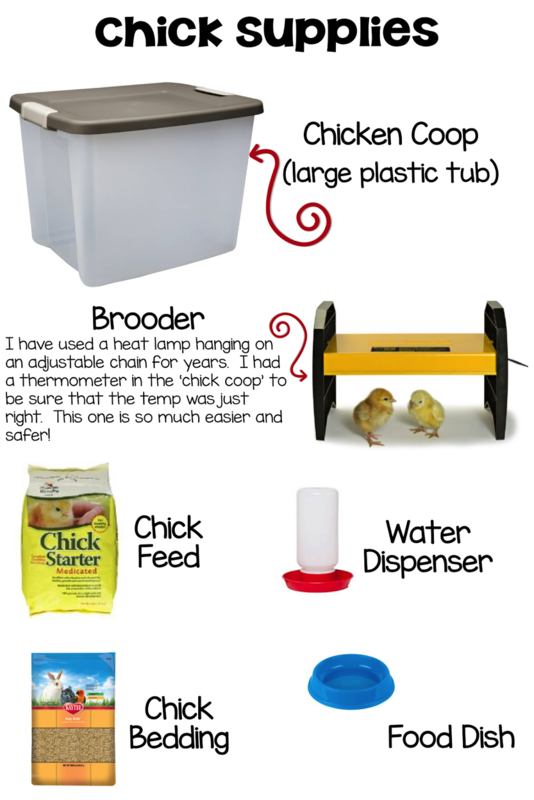 The chicks should not be out from their ‘coop’ for very long or they will get cold. 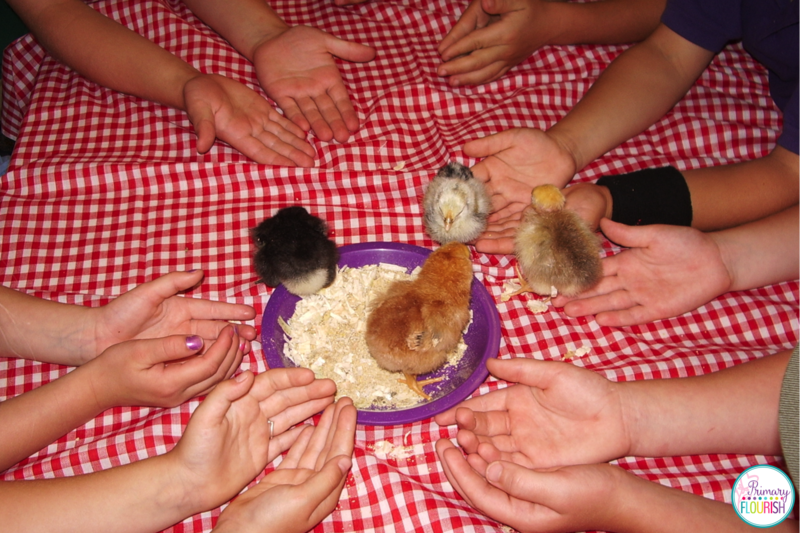 You can also let small groups visit the chicks in their chicken coop. 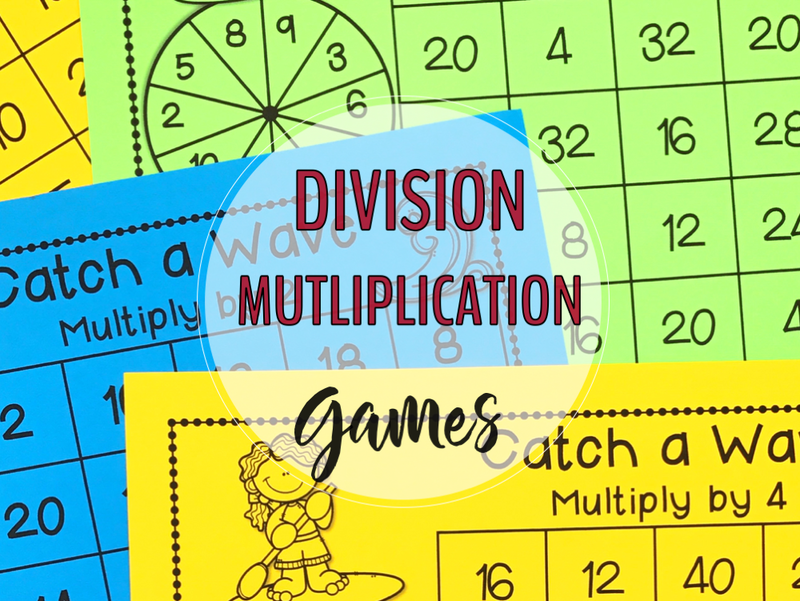 This makes a great reward for students that are on-task during the day! Bye, bye, chicks! How long do you keep the chicks in the classroom? That depends on how high your coop is and how much patience you have. They will start trying to ‘fly the coop’ after about 4-5 days. I try to have my chicks hatch on Tuesday or Wednesday and send them to their new home on Friday. I had a partner teacher who used to keep them for over a week. 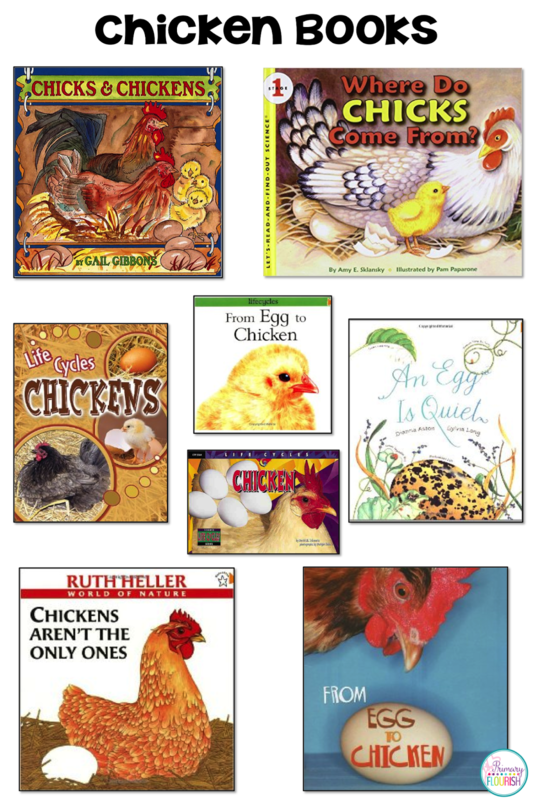 Prepare your students from the beginning for this day – remind them that chickens are not pets and they need a chicken coop to live in with other chickens. On the last day with the chicks, let the kids handle them one last time. 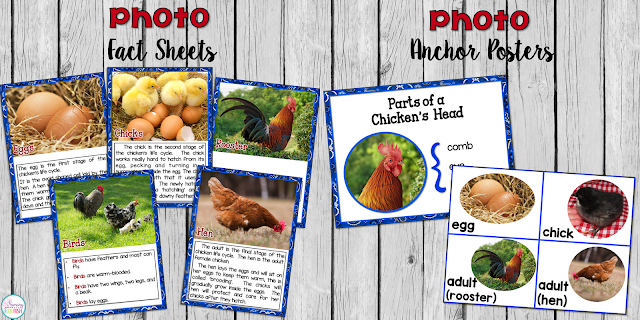 Snap some pictures of them with the chicks and you can use the photos for writing prompts in the days to come. Read your incubator’s instructions for putting it away for next year. 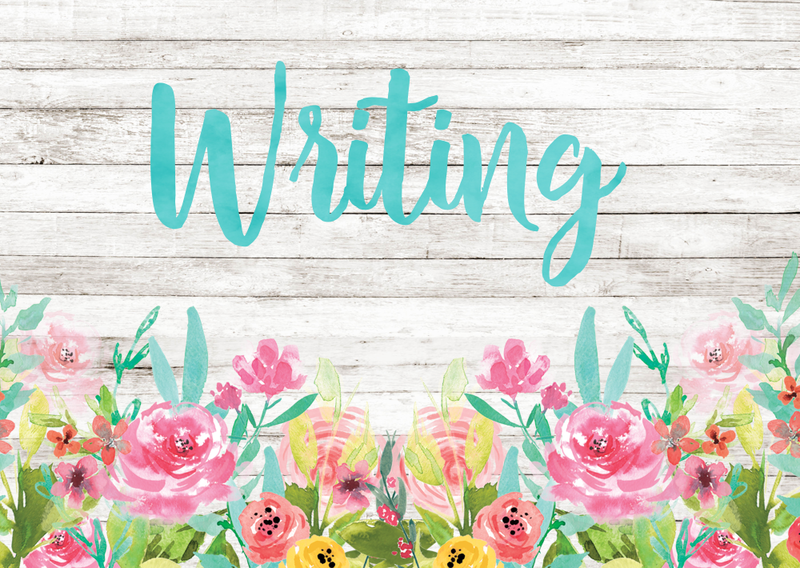 Jot down notes on what worked well and what you want to do differently next year. Just click on the pictures to go to Amazon to purchase. 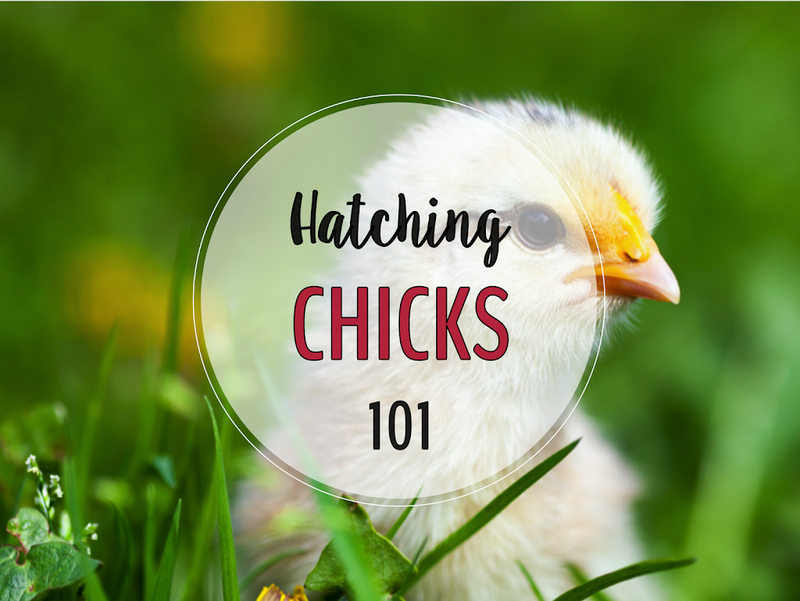 If you have never hatched chicks before I hope you will give it a try! 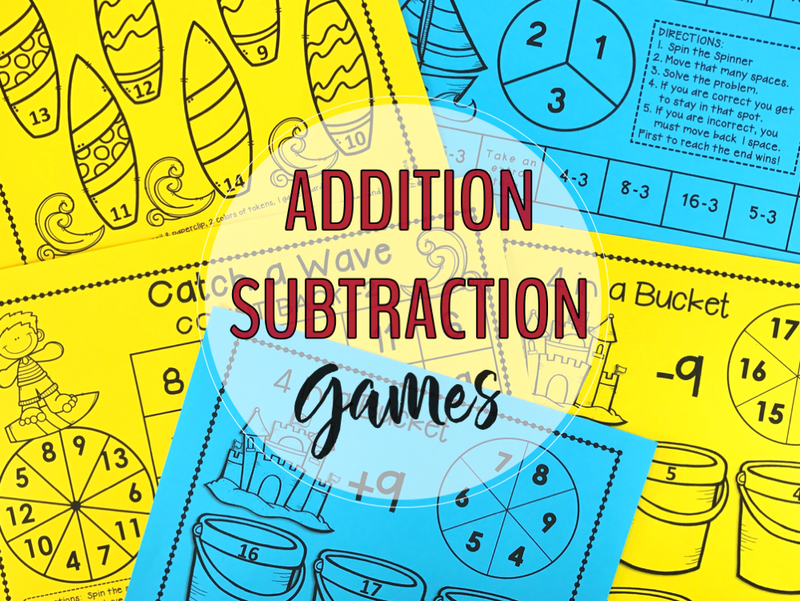 Your students will LOVE every minute of it! And it will make all the work and planning you do so worth it as you watch your students filled with wonder. You will also see them come back year-after-year and tell you that hatching chicks was their favorite activity! We are never too old to be amazed and smitten with wonder at the sight of a newly-hatched chick! Please feel free to contact me with any chick questions, suggestions, or stories! 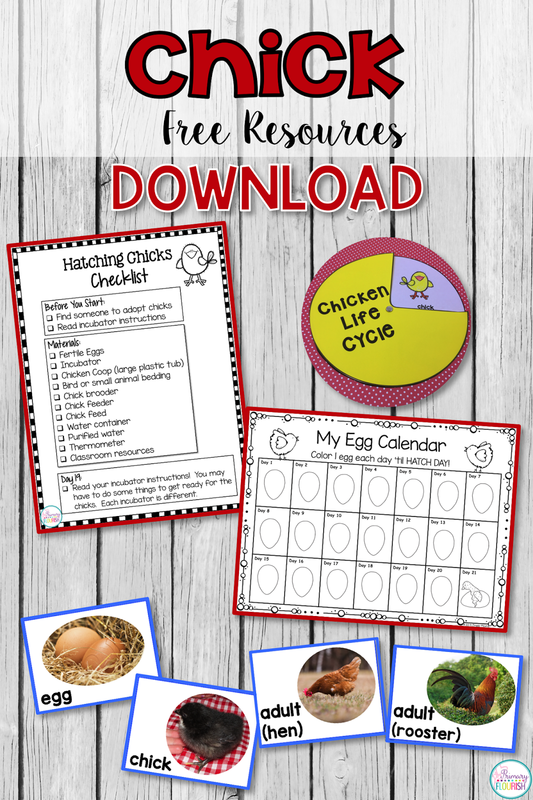 Just fill in the form below to get your copy of the Hatching Chicks Checklist, Egg Calendar, Chicken Life Cycle Circle Book and Chicken Life Cycle mini Posters. Great! Now check your email to confirm your subscription and get your download link. Wow! How fun that all looks Peggy! 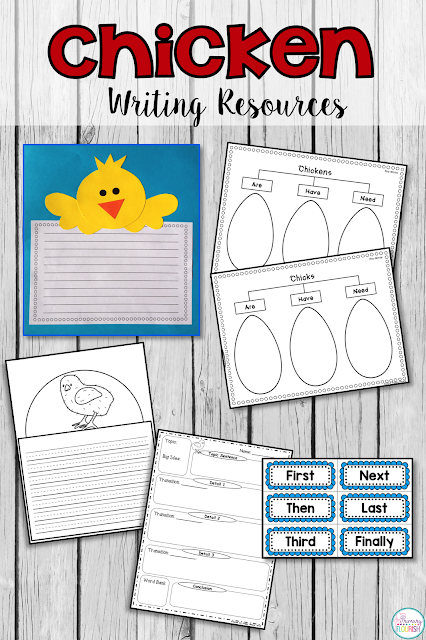 I bet your students loved those hatching cuties! Thank you, Vicky! The kids absolutely love hatching and holding those cute little chicks! Wow, Peggy! 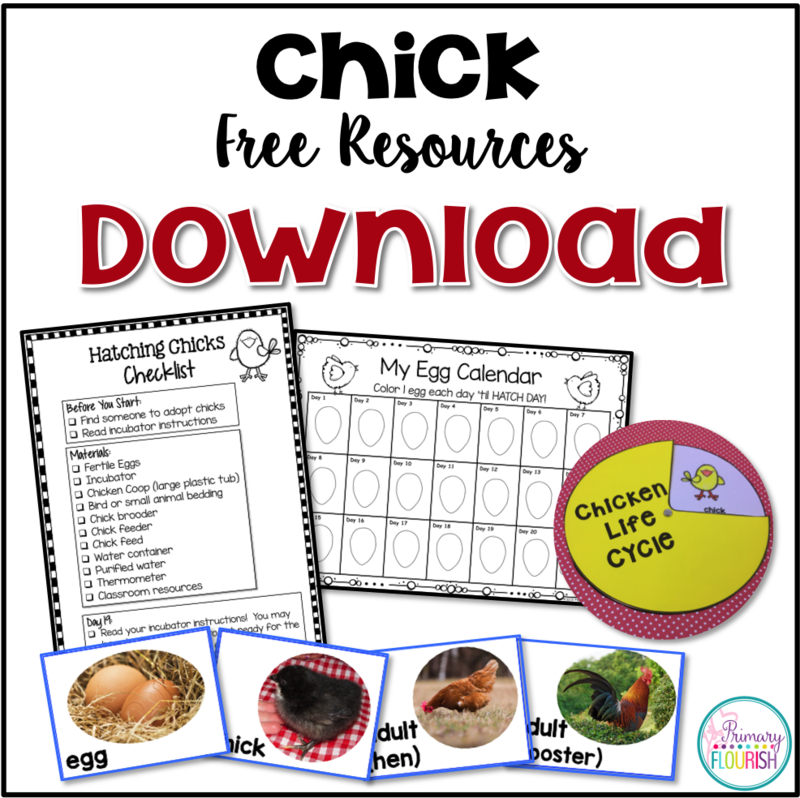 This post will be a terrific resource for anyone getting ready to start out on the chick hatching adventure. I love how you shared all of your research and insider tips! 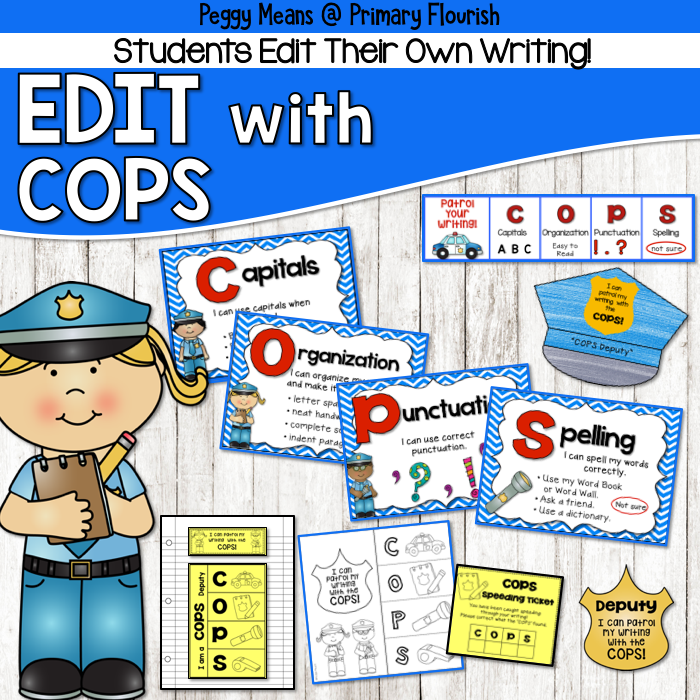 This is an amazing post Peggy, with great step by step information! Thank you, Linda! Hatching chicks is definitely a grand adventure! Thank you, Christine! 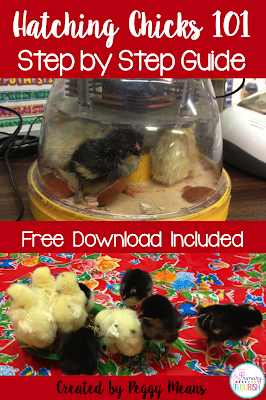 Have you ever hatched chicks in your classroom? Thank you, Brinca! I hope you do try hatching chicks! You and your kids would love it! 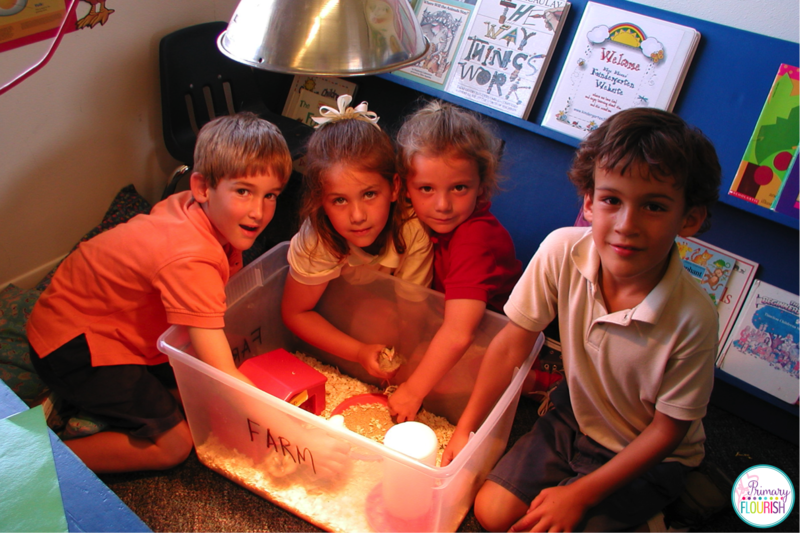 I've never hatched chicks in the classroom – I never got to because first grade does it! This information is wonderful! Thank you so much, Peggy! How many eggs do you usually keep? I am so delighted that you found this information useful! The Brinca incubator is my favorite and it holds 7 eggs. 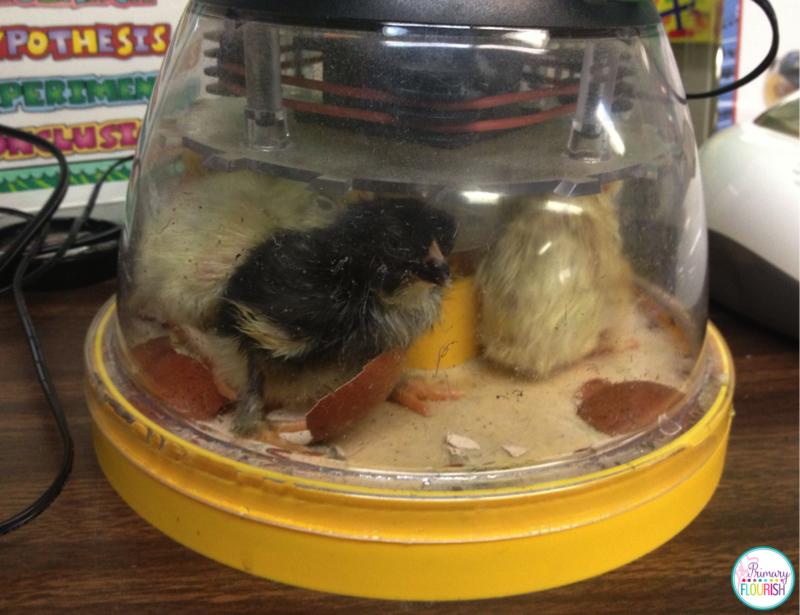 Have you ever hatched chicks in your classroom before? 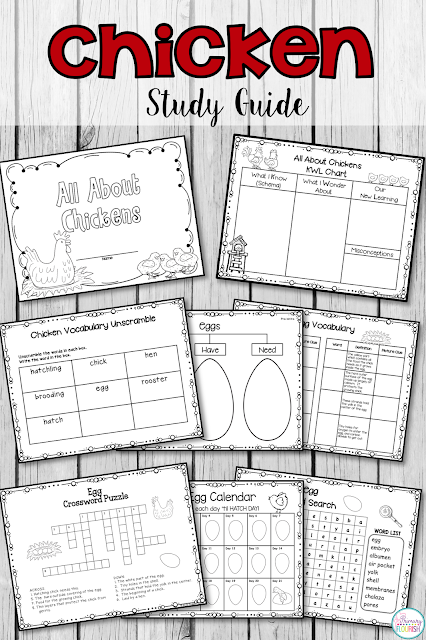 I love your chicken unit study…however, I am not seeing the check list that is pictured above. 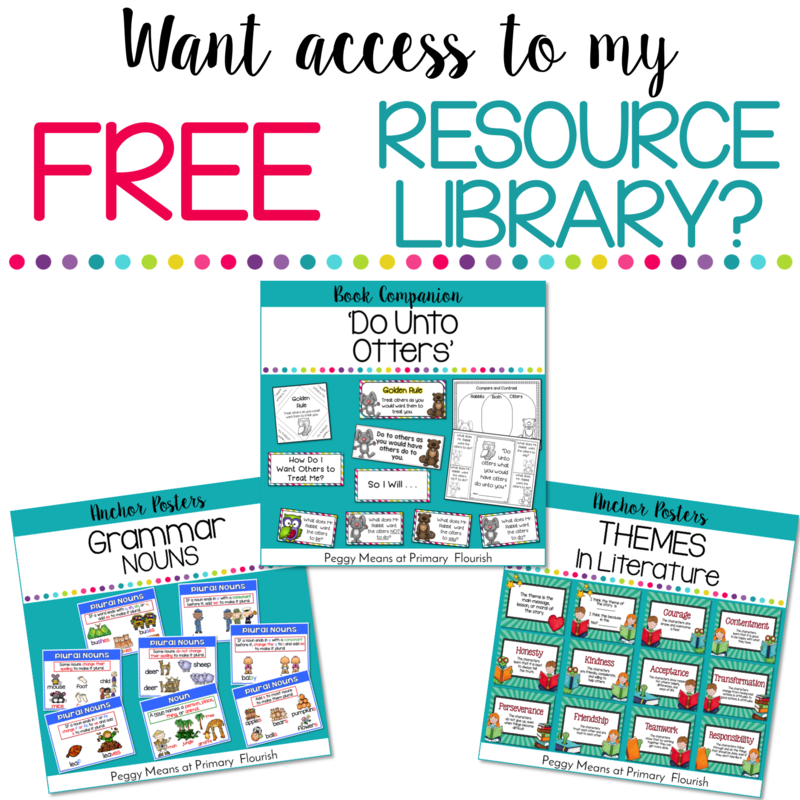 I have went through all the links and downloads and have bought your study…and still can't seem to find it…Can you help me? Hi, Ray Anne! I am so sorry for all your trouble! I linked to the other chick download. Just Go to the link above and you will find the list you are looking for.